Peppers come in many varieties from sweet to hot. They form bushy plants with pendent fruit. They start out as green and ripen to yellow, then orange to red or purple. The hotness of the pepper is measured on a scale called the Scoville Scale. It measures the amount of capsaicin in the pepper. The higher the number, the hotter the pepper. You can eat these fresh or use them in cooking. They can be dried or frozen for later use. Try a Chili String for hanging the dried peppers. The flowers will attract bees which help to pollinated the peppers. Cheyenne Pepper is a mounding pepper that is a hot, hot pepper. It will reach a height of 10" to 12" tall and just as wide. This is a great pepper for a container. Plant in full sun and well drained soil. Protect this plant from frost. Cheyenne Pepper measures 5,000 to 30,000 on the Scoville Scale. Cheyenne Pepper matures in about 65 days. Jalapeno Pepper is a milder hot pepper but it can still be hot. It will grow from 15" to 18" tall and just as wide. Pick and eat these pepper while they are still green. Plant in full sun and well drained soil. Jalapeno Pepper measures 2,500 to 5,000 on the Scoville Scale. 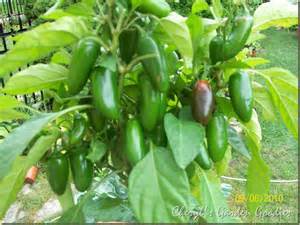 Jalapeno Pepper matures in 65 to 75 days. This Jalapeno Pepper is organically grown. Sweet Peppers are bells or banana shaped peppers. They are sweet, flavorful and crunchy. They start out as green and all will eventually turn red. Sweet Peppers are rated 0 on the Scoville Scale. Sweet Peppers can be eaten raw or cooked. You can freeze them or dry them for storage. California Wonder Bell Pepper This vegetable is organically grown. California Wonder Bell Pepper produces heavy yields of green bell peppers. This plant will grow from 10" to 12" tall and just as wide. Pick and eat these pepper while they are still green or let them mature to red. Plant in full sun and well drained soil. California Wonder Bell Pepper is organically grown and is also an Heirloom Pepper. It will mature in 65 days. Organically grown. Red Beauty Bell Pepper is a sweet, thick walled red pepper that will produce peppers that turn red earlier than other varieties. It will grow from 15" to 18" tall and just as wide. Plant in full sun and well drained soil. Matures in about 68 days. Organically grown. King Arthur Red Bell Pepper Mighty Veggie is a grafted pepper. Grafted plants are stronger, more vigorous plants and have bigger, better, and longer harvests. They have improved ability to withstand temperature swings and extremes. They also have superior defense against soil borne diseases and pests, especially nematodes. King Arthur Red Bell Pepper Mighty Veggie is a sweet pepper that is easy to grow and a great source of antioxidants. It is excellent for eating, canning, or freezing. These can be picked green at 60 days or allowed to ripen to a sweet, deep-red in 75 days. Orange Bell Pepper Mighty Veggie is a grafted pepper. Grafted plants are stronger, more vigorous plants and have bigger, better, and longer harvests. They have improved ability to withstand temperature swings and extremes. They also have superior defense against soil borne diseases and pests, especially nematodes. Orange Bell Pepper Mighty Veggie is a sweet pepper that is easy to grow and a great source of antioxidants. It is excellent for eating, canning, or freezing. These can be picked green at 50 days or allowed to ripen to a sweet, deep-orange in 78 days. Sweet Banana Pepper produces loads of peppers that are yellow but will turn red as they age. It will grow from 15" to 18" tall and just as wide. Plant in full sun in well drained soil. Sweet Banana Pepper can be eaten fresh or is one of the main peppers used for pickling.